Private Dockless Bike-Share: A Blessing Or A Curse? Spin bike-share bikes on Wilshire Boulevard. All photos by Joe Linton/Streetsblog L.A. 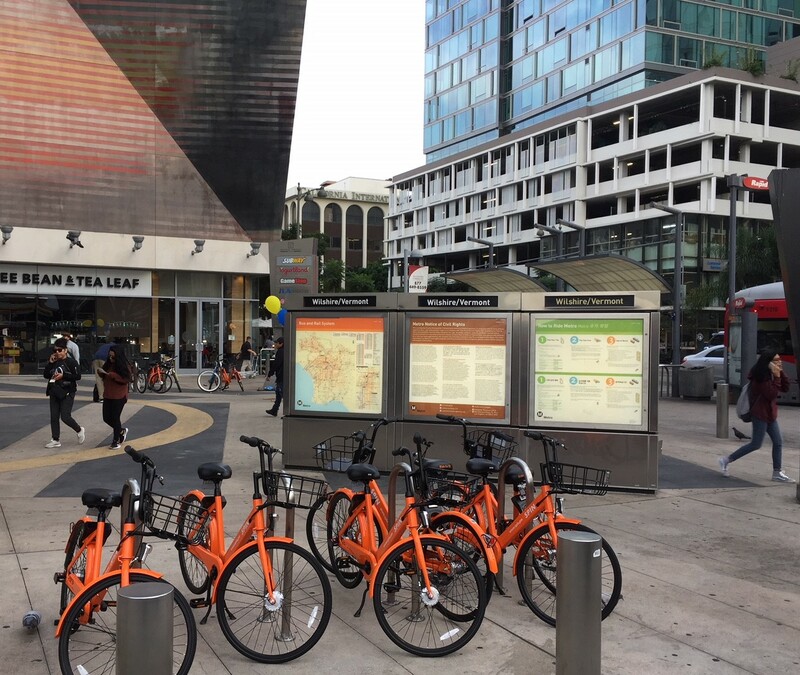 Yesterday morning, social media posts heralded the arrival of bright orange bike-share bikes located at several Koreatown subway stations. The bikes represent the introduction of Spin dockless bike-share into the L.A. market. 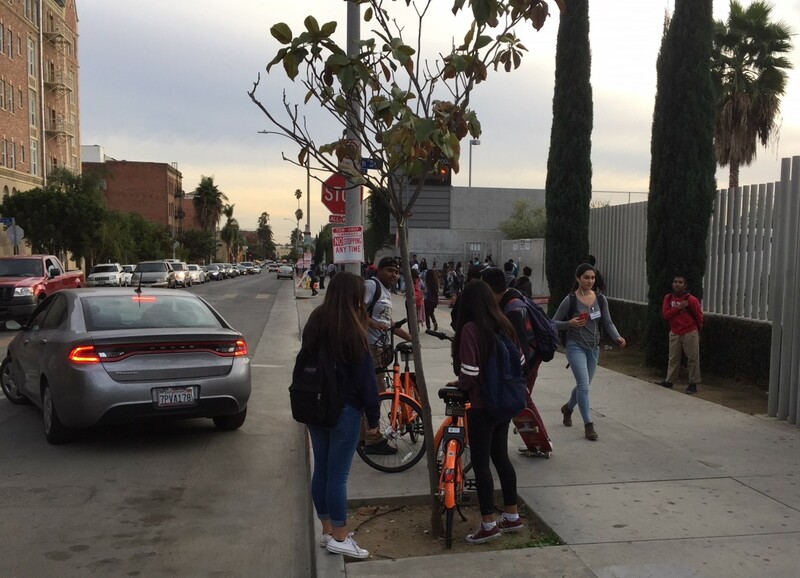 Yesterday afternoon, Streetsblog spotted plenty of Spin bikes at Wilshire/Vermont, Wilshire/Western, and along the north and east sides of Ambassador School. The locking mechanism on Spin bike-share secures the back wheel only. The bikes shown above are next to bike racks, but not actually locked to them. Spin is the third for-profit dockless bike-share company to begin operations in the city of Los Angeles. If one counts permitted smart-bike dockless (perhaps dock-optional or dock-light?) 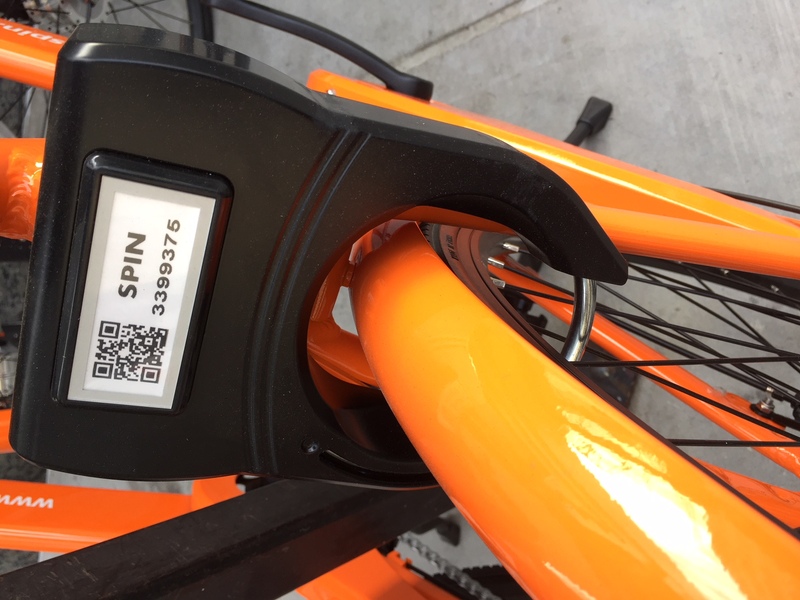 systems – Santa-Monica-based Breeze operates in Venice, and Bruin Bike Share at UCLA and in Westwood – then Spin could be counted as the fifth dockless system in the city. In early November, ofo began “partnering with @LACityParks” to offer dockless bike-share in Griffith Park. 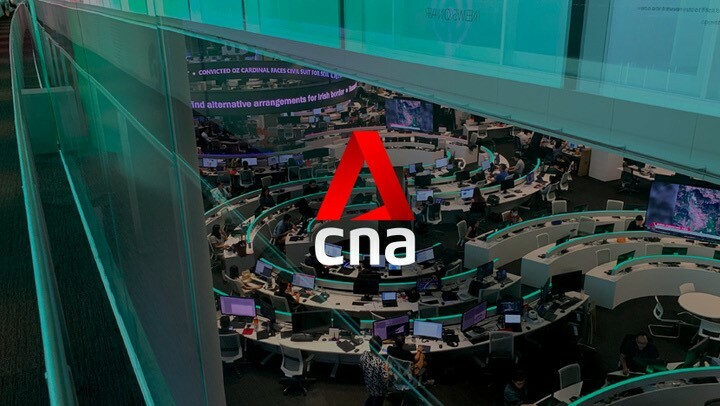 The new offering was covered by KPCC and CiclaValley. Also in early November, LimeBike started a “three-month pilot” of dockless bike-share in Los Angeles City Councilmember Joe Buscaino’s district which extends from Watts to San Pedro. For-profit dockless bike-share has become common in parts of China. Companies have recently expanded to some U.S. cities, including Seattle. 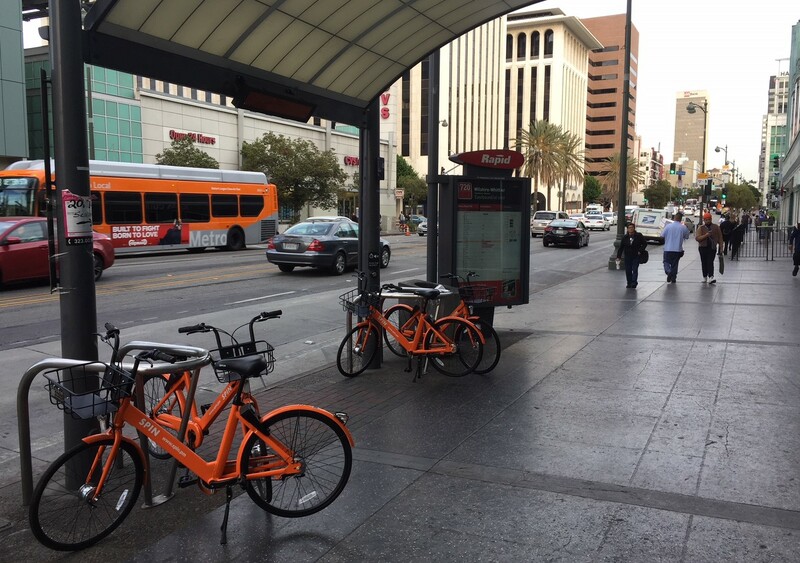 The city of L.A. has not taken any official action to approve or disapprove of dockless bike-share, but the systems appear to have the support of councilmembers Buscaino and David Ryu. Ryu has been skeptical of making streets safer for bicycling, but introduced a motion (council file 17-1125) that calls for a dockless bike-share pilot in the city. In an earlier SBLA article, Robert Gottlieb described for-profit bike-share’s early business model as similar to Uber ride-hailing: “approaching cities […] without consultation and pushing against any regulation.” Dockless companies are scrambling to broadly distribute cheap bikes in order to gain market share. To do this, they burn through venture capital. So, when the dust clears, there is no assurance that private bike-share will be able to operate profitably at its current one-dollar per ride rate. Especially in comparison with the relatively-robust Metro Bike Share and CycleHop (Breeze, etc.) systems already operating in L.A. County, the for-profit dockless bikes appear to be somewhat shoddily made. The handlebar grip failed on this Spin bike on the first day it was deployed in L.A. 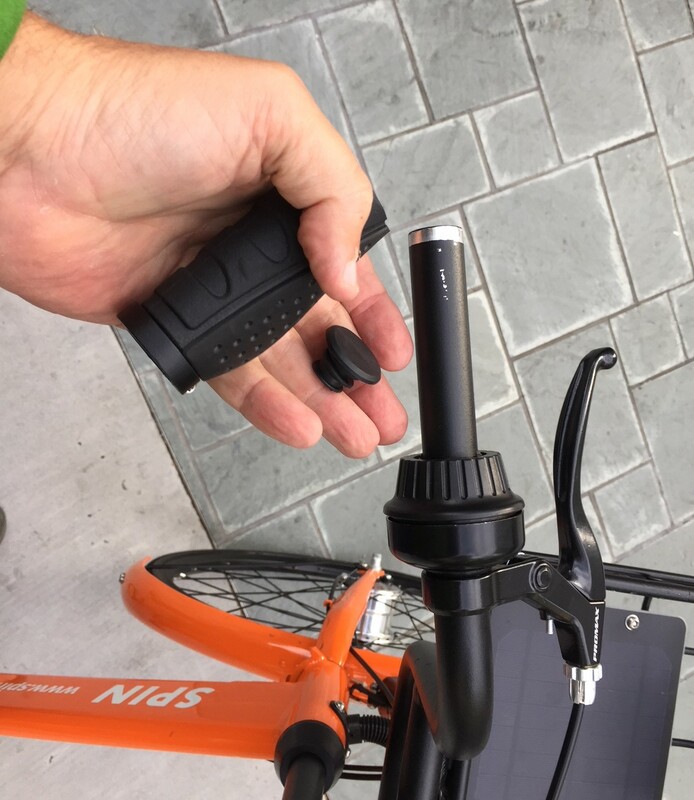 Yesterday, on the first day it was in operation in Los Angeles, the handle-grip was already loose on the one Spin bike Streetsblog L.A. tested out. Another problem occurs when private bike-share companies have failed. When users sign-up, the company takes a deposit from the user’s credit card. When Chinese bike-share company Bluegogo failed, users were unable to recover their deposits. For greater Los Angeles, one big question is what effects these bikes will have on existing municipal bike-share systems. Metro Bike Share and CycleHop (Breeze, etc.) are in place and even expanding. Though agencies and operators have praised their accomplishments, system usage has been sparser than might be expected. LADOT General Manager Seleta Reynolds stated that the $3.50 per ride cost is “too expensive.” Metro’s pricing structure, with a goal of 80 percent fare recovery (much higher than what Metro expects from its highway, transit, or parking projects), has resulted in bike-share serving a niche ridership. The cost plays a big role in the Metro Bike Share system not serving the needs of low-income communities. At $1 per ride, private dockless bike-share looks like a huge bargain compared to Metro’s $3.50. Also, private bike-share is “free” for cities, in that it operates with no public subsidies. The cheaper-for-the-public and cheaper-for-the-customer comparison gets people – including elected officials and agencies – thinking that they should just let the private sector do bike-share, instead of investing public funding to implement municipal bike-share. At a recent talk, Metro innovation chief Joshua Schank stated that there are dramatic changes happening for bike-share with “docks going out of favor.” One caveat is that, similar to Uber and Lyft car rides, those dollar bike-share rides are subsidized by venture capital, and when that capital runs out, there is no guarantee that the rides can remain at such low prices. Will private bike-share bankrupt Metro bike-share? Or will it pressure Metro to reconsider its fare structure? Or will multiple bike-share systems operate simultaneously and independently with little to no effect on each other? With a lack of political will and limited public investment (not to dwell on an unhelpful low-grade turf-war where Metro stifles CycleHop expansion), it looks like it will take a long time for municipal bike-share to expand to all Southern California neighborhoods where it would be viable. Given the long timeline, perhaps private bike-share can play a role in bringing bikes to places that are not yet on Metro’s or CycleHop’s radar. Among these bike-share deserts, are low income areas. In Chicago, the community group Slow Roll Chicago is working with ofo to provide bike-share in low-income communities of color not served by the Divvy municipal bike-share system. In L.A., LimeWire has made a point of sharing visuals that show they are serving the Watts community. Though overall and over time, private companies may be likely to concentrate their mobility services in higher revenue areas, such as tourist-rich Westside beach areas. For-profit dockless bike-share has potential for good, but also presents potential pitfalls. What do you think readers? Have you ridden these bikes – in L.A. or elsewhere? Will private dockless bike-share be a good thing for Los Angeles? What role should the city and the community play in fostering benefits and avoiding pitfalls? I grew up in San Pedro and visited for Thanksgiving. I was SO excited to see LimeBikes around the city, I used them about 10 times, for free, with credits I got from their rollout promo. I had a problem with one bike seat being stuck and some skipping gears, but I had the exact same problems in the first month of the Nike branded BikeTown rollout here in Portland which uses SocialBikes (the same ones they have in Long Beach). The NIMBYs on the Saving San Pedro Page were freaking out about these bikes, but I found people to be curious about them and very supportive once they understood how the system worked. I used the bikes to connect to the Silver Line, to visit my grandmother’s assisted living facility, to patronize neighborhood businesses, and for a leisurely ride around my old paper route. In my past visits home, I have heard people complaining a lot about how empty all the new bike lanes were, etc. Well I saw more people riding bikes last week than any other time I’d visited and I hope these will encourage a lot more bike riding in the city where I’m from. As a comparison, I took a MetroBike from the Rose Bowl into Old Town Pasadena on Friday. The sign-up process for that system was HORRIBLE and the riding experience from that station to the one in Old Town (which was a block off the main drag in a pedestrian alleyway) was bad. Political concessions for station placement etc, hobble the city run shares in most towns, unfortunately. I thought the headline was hyperbole initially, but the shoddiness depicted gives some credence to it. I tried the Metro, Limebike and Spin bikes at the transportation expo, and found the dockless variants to be sportier (lighter, less upright posture), though less smooth, stable. Not a difference I’d pay double, let alone 3.5x for. Is dockless bikeshare financially sustainable with quality bikes, maintenance and rebalancing? Honestly, no one besides the employees and the investors really knows, and maybe it’s too early for even them to tell. It’s plausible that they can be (~$1500 in revenue for $0.50 fare, twice a day, for four years on a $400 bike). However, more bikes in more places could encourage more people to ride, so that’s definitely a plus. Breeze and Bruin (CycleHop/SoBi) are not dockless in the same sense that LimeBike, Ofo, and Spin are. No term seems to have traction, but I call them dock-optional, as it costs more if you don’t return them to a bike rack hub defined by a geo-fence. The result is a much more orderly pattern of use. As a Metro Bike Share user in the DTLA area, I’ve found the service certainly more convenient than no bikeshare at all, but less convenient than a dockless or dock-optional system, as being forced to end all bikeshare trips at a dock means I don’t have as much freedom to make spontaneous stops at cafes and stores that I pass by and instead have to hunt around for the closest dock to leave the bike. Great point about station placement. Don’t know that one specifically, but I got angry when, in Brussels, they couldn’t put the bikeshare within a block of the tram stop, but they could put dozens of parking spaces. Dockless could get disorderly, but it would put pressure on putting bike parking where it’s needed, and not where it’s least resisted. Zagster, which operates some 200 dock-based bikeshares, has announced a successful trial of making an existing system dockless, and saw ridership increase 7 times! Bikes would be locked via cable to any street fixture. This has almost all of the benefit of dockless, with much less risk of vandalism/clutter. The biggest perk is that Zagster could do this on existing bikeshares. (I don’t see why Social Bicycle could do something similar here, in Santa Monica, WeHo, Westwood, etc.) If the ridership increases are big, it could pay for the increased rebalancing needs. Downsides, it would be marginally less convenient, and would take up more rack space – which could be ameliorated by more, well placed racks. I’d like to see these go head to head against ‘lockless dockless’ to see which one fares better for riders and cities. Does anyone know how they verify that users locked bikes to something appropriate? Because the bike doesn’t move unless unlocked? The cheaper-for-the-public and cheaper-for-the-customer comparison gets people – including elected officials and agencies – thinking that they should just let the private sector do bike-share, instead of investing public funding to implement municipal bike-share. Quite frankly, unless the city in question is Amsterdam or Copenhagen, that thought is quite appropriate. Americans don’t lack bikes, they lack safe places to ride them. In so much that any public money for bike share could’ve instead been used for infrastructure, it is being misappropriated. If private sector players are willing to throw money after bike share, then set up a few rules and let them have at it. It seems to me that a strength of the dockless system is that a bike which is placed inconveniently can be moved (if someone feels comfortable doing so). In fact I think the bikes should include a sticker encouraging people to move them if they feel they are in an inappropriate place. Most of the bad placements are in places you wouldn’t put it if you had to lock it to something, so I think odds are better with mandatory locking. Plus vandals can’t move bikes as easily. Returning users are more reliable than random passersby. Anecdotally (based on 6-7 of my friends), were cyclists, but after getting bikes stolen, in some cases multiple times and even with locks on them, they stopped riding. Is there any larger, more robust data on how many people fall into this category? If the number is significant, it would suggest that bike share may still be a worthwhile investment, even with crappy infrastructure, because it would remove the “my bikes keep getting stolen” barrier. But I emphasize, I’m using anecdotes here. Yep, this is true. Best thing about bike share is that it creates illusion of need for infrastructure but really it’s just a money pit that will force politicians to say “I don’t get it, we put out all these bikes and nobody is riding. Now that we’ve poured millions into the bikes, we need to pour millions into the infrastructure to make them useful.” This is super backwards, wish money would go directly to infrastructure. Put all the bike shares you want, my grandma still won’t ride and she never will unless there is safe infrastructure. Leave it to LA politicians to anything but build a network of protected infrastructure. Sharrows, costly off-street recreational bike paths, bike share, “mobility hubs”…just not any real bike network. Dockless seems necessary in sprawled cities like LA. Even Seattle still needs dockless (we have ofo, Spin, LimeBike) and it’s generally more compact than LA. Too many distant destinations for docked bike share systems. Though docked should be the goal in cities for the reasons you mentioned above. NYC and DC should say no to dockless and be smart about their docks, Seattle and LA should let them have their time. I think their app is not very good. There’s no way to find out where bikes *might* be. Worst of all the apps I have looked at and probably, based on the hand grip photo, worst of the bikes too. 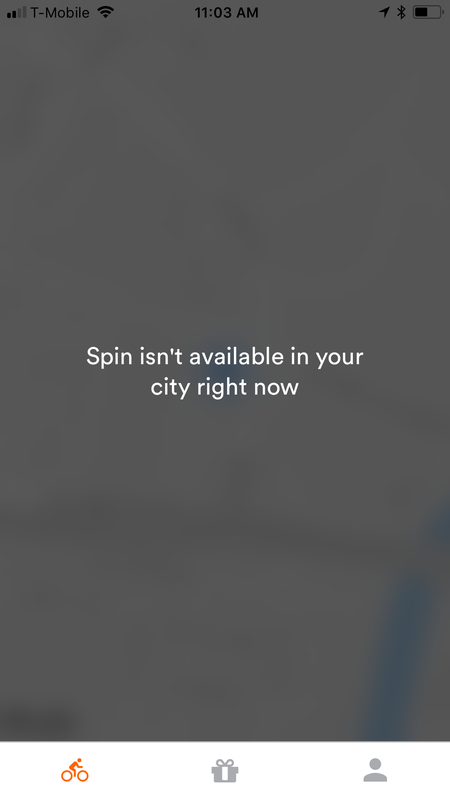 The bikes reappeared on the app – looks like (as of Friday 12/1 4pm) the total number of Spin Koreatown bikes is holding at about 50. That cache of hundreds of bikes (most of them stripped of various parts) found by Orange County Sheriff’s deputies near a “homeless encampment” indicates that bicycle theft is a major headache to cyclists. Yes, I do agree that bike share does (largely) solve the bike theft issue. However, I’m not convinced that it’s the best approach to the problem. The money that goes into bike share could fund better bike parking that is more resistant to theft and a good bike network that a lot of people use creates a healthy market of cheap bikes that aren’t really worth the time to steal. Of course, the bike parking can be used by both bike share and others, so there can be more balance there. A blessing or curse? How about a blurse? Are you people completely asleep at the wheel? All of these bikes represent the implementation of United Nations Agenda 21/2030, which equates to total government control of everything you do and say. If you think you need total government control of yourself, please do the world a favor and take an overdose of the medication you’re on or jump off a high bridge. If you don’t understand what I’m talking about, google Agenda 21 or you can find out all about their diabolical plan to commit the largest scale genocide of humans ever known right at the United Nations website. The plan also includes removing cars from private ownership, removing real property from private ownership. I can’t believe no one else is talking about this on here. What a shame, so many ignorant people are going to be the cause of their own demise. Hand grips don’t equate to bike quality. More of an install issue and the share company not inspecting. Grips just slide on, and are tight fitting if not lubed up too much when put on. I tried bike share in two cities and found the same frustration with docks. Having to find a dock station, one that has space, and within a time limit for time based payments. Dockless would be less stressful except finding a bike could possibly be harder. Yesterday's Iconic Wilshire CicLAvia opened a roughly four-mile route from downtown Los Angeles to Koreatown. Cyclists, runners, walkers, and skaters enjoyed car-free streets. Dockless Shared Bikes: From China… To Los Angeles? In Shanghai streets, the most striking visual change were the thousands of yellow and orange and other color bike-share bikes in the streets. Tomorrow, the L.A. City Council Transportation Committee will be discussing how to permit dockless bike-share. Dockless bike-share is coming to Camden, New Jersey, and Chicago's South Side. But so far, the commitments have been small.